This report has projected migration and population growth, household formation, housing demand, and employment growth. In this section, these projections are contrasted with those in Hemson Consulting's Growth Outlook for the Greater Golden Horseshoe, commissioned by the provincial government, and IBI Group's Toronto-Related Region Futures Study, funded by the Neptis Foundation. Table 21 compares the preceding projections for population growth with those in the Hemson report. Over the 30-year period, the population projections in this report (WDI) total about 1.1 million less than the Hemson projections. The difference amounts to an average of about 36,900 people per year. Most of the difference in the projections is in the Inner Ring, where the WDI projections are 1.09 million lower than the Hemson projections. For the Outer Ring, the projections are quite similar. The projections differ for all three of the decades in the projection period. In the first decade, the WDI projections are about 200,000 less than the Hemson projections. In the third decade, the difference between the two projections is more than 500,000. The differences between the two are largely due to expectations about migration. The following section compares the migration assumptions. Table 22 compares the WDI population projections with those in the Neptis-sponsored Toronto-Related Region Futures Study by IBI. In the IBI projections, the first period covers 11 years (2000-2011), so the IBI projections were reduced pro rata to allow for comparisons. Also, the IBI projections did not include two Census Divisions included in the WDI and Hemson projections, Brant and Haldimand-Norfolk. Therefore, the WDI projections have been adjusted to exclude them. The WDI projection of total population growth (2.57 million) is about 500,000 less than the IBI projection. There is a large negative difference in the projections for the Inner Ring of about -600,000. For the eight Census Divisions in the Outer Ring, the WDI projections are about 100,000 higher than the IBI projections. The projections are quite similar for the first decade of the projection period (for all areas combined), but there are increasing differences in the second decade (about 160,000) and third decade (about 360,000). Table 23 contrasts the assumptions for the components of migration. A summary of the results (by component of migration) follows the table. Over the 30 years of the projections, the Hemson assumptions for net immigration (i.e., immigration minus emigration) are, in total, about 268,000 higher than those in this report. The Hemson report indicates that from 1991 to 2001, net international immigration to the GGH was 80,500 people per year. In the WDI projections, the average over the 30-year period (for the GGH) is about 77,700 people per year, or 3.5 percent lower than the 1991-2001 average. In the Hemson projections, the average over the 30 years is 86,700 people per year, about 7.7 percent higher than the 1991-2001 average. This report argues that the economic cycle in the GTA has peaked and that a return of the employment ratio to a "normal" level should result in the GGH receiving a lower share of Canada's immigration than it did in the late 1990s and early 21st century. Recent data shows that the GGH share of immigration is falling in response to the changing economic environment. During the past two years (2002-2004), net immigration to the GGH averaged 91,600 people per year; during the previous two years (2000-2002), the average was higher, at 119,200 people per year. These projections assume that net immigration will decline further because of the softening of the economy and higher house prices. The differences between the two sets of projections may be partly due to emigration. In this analysis, it is assumed that emigration increases over time with the growth in the population. From 2021 to 2031, emigration is expected to be about 7,000 people per year above current levels. Rising emigration is certainly a factor in the decline of net immigration. The Hemson report does not specify assumptions for emigration and therefore it is not possible to compare the approaches or estimates. Immigration to Canada is assumed (by both Hemson and this report) to be about 210,000 people per year over the 30 years. If emigration is about 60,000 people per year over the period, net immigration to Canada will be about 150,000 people per year. Using an average net immigration assumption of about 86,700 people per year, the Hemson analysis assumes that the GGH will receive about 58 percent of Canada's net immigration. It is questionable whether such a high share can be sustained, when the GGH accounts for only about 28 percent of the national population. 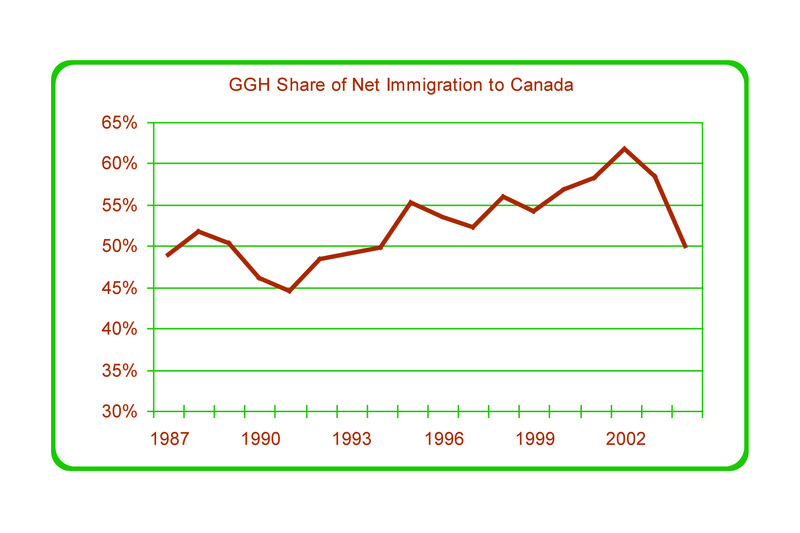 Moreover, during the past 18 years, the GGH share of Canada's net immigration has averaged 52.3 percent. The assumption in this report is that GGH net immigration will average 77,700 people per year over the next 30 years, or about 52 percent of Canada's net immigration. This is in line with the historic average. The Hemson report assumes that net interprovincial migration to the GGH will be positive during the projection period, averaging about +3,200 people per year; the projections in this report (WDI), however, assume that this component of migration will be negative, averaging about -6,200 people per year over the 30 years. The Hemson report shows an average of +2,400 people per year for the 1991-2001 period. Annual data show that net interprovincial migration to the GGH has declined for four consecutive years, and was about -4,400 people per year in 2004. Thus, the assumption in this report for the 2001-2011 period (-1,500 people per year) is higher than the most recent actual figure (-4,400 people per year). The assumptions of long-term negative net interprovincial migration are based on an analysis of past trends, which indicate that increased house prices, combined with a "normal" employment rate (lower than in recent years, in which the economic cycle has been at a peak), result in relatively weak interprovincial migration. Over the 30 years, these assumptions for net interprovincial migration are 282,000 people per year lower than the Hemson projections. There is little difference between the projections, as the Hemson projections assume a small net loss (-20,000 people over 30 years) for this component, while the projections in this report assume a small net gain (+8,100). Combining the three components of net migration, the assumptions in this report result in total net migration of 2.15 million people over the 30-year period. While this is a substantial source of population growth -- averaging 71,700 people per year -- it is lower than the Hemson assumption of 2.67 million net migrants (89,200 people per year). The WDI projections are also lower than the 1991-2001 average, which the Hemson report shows as 82,700 people per year. The lower migration assumption in this analysis is based on the assumption that a "normal" employment rate combined with high house prices will deter in-migration and encourage out-migration. The deterioration in the WDI assumptions is also partly due to growth in emigration (the consequence of a rising population), while total immigration to Canada is assumed to be flat. The projections in this report indicate that household formation could total about 1.34 million from 2001 to 2031, or about 44,600 households per year. This is 372,000 households (22 percent) lower than the Hemson projection of 1.71 million households (57,000 households per year). For the Inner Ring, the WDI projections average 27,865 new households per year during 2001 to 2031, substantially below the average of 42,000 households per year projected by Hemson. In contrast to these two sets of projections, from 1987 to 2004, housing starts in the GTA averaged 33,678 units per year (see section 2 of this report); from 1999 to 2004, GTA starts were higher, averaging 45,098 units per year. The WDI projections are below the 1987-2004 long-term average, reflecting that demographic change will tend to slow housing activity. The Hemson projections, on the other hand, are close to the 1999-2004 average, suggesting that long-term housing activity will remain at levels seen in recent years, which represent the peak of a market cycle. Thus, the WDI projections are based on an assumption that over the 30 years, economic and housing market conditions will be similar to the long-term average; the Hemson projections appear to depend on the continuation of peak economic and housing market conditions for 30 years. From 2001 to 2011, the WDI projection (548,000 households) is about 50,000 (9 percent) lower than the Hemson projection. From 2011 to 2021, the difference between the projections increases to about 135,000 households (22 percent). From 2021 to 2031, the difference expands again, to about 185,000 households (37 percent). These differences are mainly due to different expectations for population growth and partly due to differences in household sizes. In the Hemson projections, in 2031 the average household size is 2.62 people; in the WDI projections, the average is 2.53 people. If the average household size were the same in both projections, the total number of households projected by WDI would be even lower. Given its population projections and the associated age distribution, this report has estimated that employment growth will decline over the 30-year period. This is partly due to the slowdown in population growth, but mostly due to the shifting age structure of the population: over time, an increasing share of the adult population will be retired, and the percentage of adults available for employment will fall. The analysis showed that if employment rates by age group remain at 2001 levels, the percentage of adults (in the GGH) who are employed would fall from 64.2 percent in 2001 to 57.6 percent in 2031. Table 25 compares projections of employment and employment growth in this report and the Hemson report. The Hemson report projects the creation of 700,000 more jobs than this report does. Hemson assumes that participation rates will continue to rise from the levels in the 2001 Census. However, the economic cycle probably peaked at about the same time as the 2001 census, and the employment rate has since declined; therefore, an assumption of further growth in the labour force participation rate seems questionable. Hemson also assumes that labour force participation rates will return to 1980s levels. Again, this is questionable, since the economic cycle has peaked. Moreover, labour force activity was boosted in the late 1980s by a "bubble" housing market and economy, and by extremely high housing costs, which forced people to work more than they might have otherwise. Finally, demographic change since the 1980s (more people at retirement ages and more early retirements) will lower labour force participation. Thus it appears unlikely that labour force participation will return to 1980s levels. Hemson assumes that women over 40 will continue to have rising participation rates. Hemson assumes that there will be "a small increase" in the participation rate of people over 65. A simulation was conducted using the Hemson population projections for the Inner Ring. Table 26 shows the Hemson population estimates for 2001 and 2031. The actual 2001 employment rates for the Inner Ring (by age group, using census data) were applied to project total employment and employment growth by age group. This analysis projects total employment growth of about 1.21 million jobs from 2001 to 2031, or about 12 percent less than the Hemson projection that Inner Ring employment will expand by 1.38 million jobs. If the same 12 percent factor also applies to the projections for the Outer Ring, total employment growth in the GGH would be 1.54 million jobs, about 210,000 lower than the Hemson projection of 1.75 million jobs. This factor explains about one-third of the difference (707,000 jobs) between the WDI and Hemson projections. The rest of the difference (close to 500,000 jobs) is due to different projections of population growth. In the WDI analysis, age-specific employment rates were applied to the population. Given the changing composition of the population (an increasing share of the population in retirement ages), the average employment rate falls. In the IBI analysis, it was assumed that employment would rise relative to the population, and thus, the changing age-structure of the population was not considered. The differences between the two sets of projections are large for all three decades (about 223,000 jobs in the first decade, 243,000 in the second decade, and 320,000 in the third decade). The projections prepared by WDI are considerably lower than the projections by Hemson Consulting Ltd and by IBI Group. The differences are primarily due to different expectations about migration. The WDI analysis concluded that based on a "normal" economic environment (in which the employment-to-population is ratio is similar to the average rate seen over the past business cycle), net migration is highly likely to fall from recent levels, which have been bolstered by the peaking of an economic cycle. Furthermore, the aging of the population will, in the long term, cause the employment rate to decline, which will further reduce migration levels. This long-term decline in migration can be interpreted as the consequence of increased retirement, which will cause some people to leave the Inner Ring, to return to their original communities, or to move to other communities with lower costs of living or what they perceive to be different qualities of life. The consequences of falling migration will be slower population growth, which leads to decreased household formation and housing demand, and reduced employment growth.